What is a Platform Parking Lift? Platform lifts are unique from other parking lifts in that they feature multiple parking spaces across two or three rows. More importantly, depending on the model you select, two or three vehicles can park on independently operated lift decks. This means that one vehicle can be lowered while the other platform(s) remains still. It’s a massive time and energy saver over double-wide, single-platform models. What’s the Difference Between a Platform Lift and a Regular Double or Triple-Wide Parking Lift? Most parking lifts operate by lifting and lowering a fixed ramp. On a standard tandem lift, both decks move together, which means moving a single car from the top requires you to move both vehicles in the lower spots. The PL-6K car lift series eliminates this “shuffle” by allowing each platform(s) to descend independently of the other(s). Who Benefits from a Parking Lift? 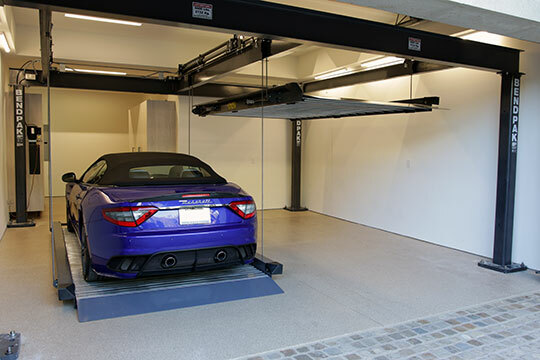 Our car lifts are meant to hold two or three vehicles across, so any garage that houses one needs to have enough room for the installation and placement of the unit. They’re ideal for anyone who owns or cares for four to six vehicles at a time, which includes hobbyists, car collectors and auto shop owners who need extra vehicle storage space. Are there Multiple Models Available? What are Their Differences? Yes. There are three​ models in the PL-6K series. PL-6KDT: A double-wide parking lift. PL-6KDTX: An extended-width, double-wide parking lift. 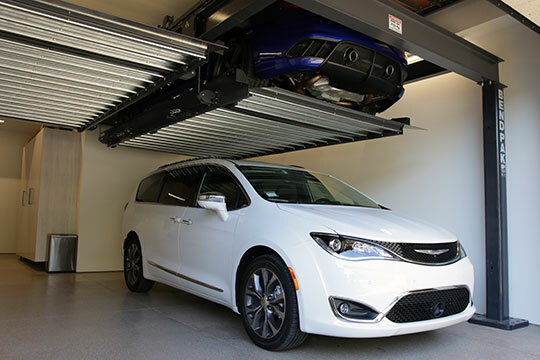 PL-6KT: A triple-wide parking lift. What do the Cables Do? The cables we use work alongside the hydraulic cylinders to provide lift power, but they also stabilize the platforms. The cables are used because we had to keep space between the lift decks. 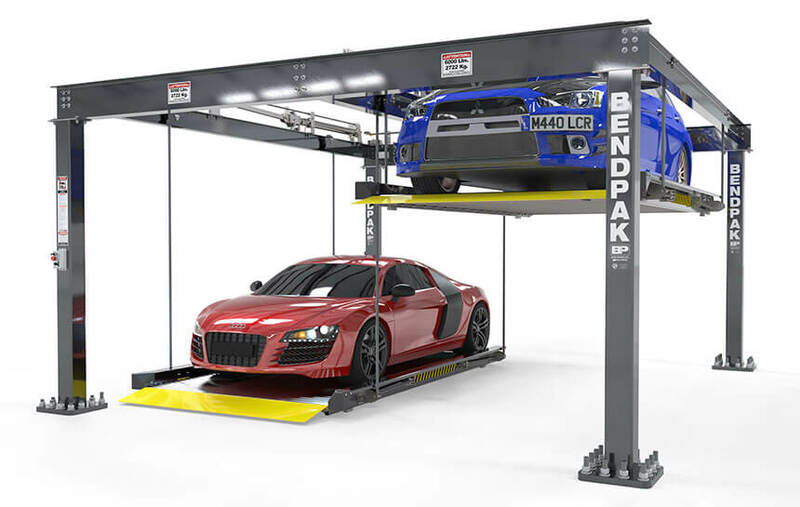 Most car lifts feature a crossbeam that functionally makes the lift platform a single-platform unit, even if there are two parking spaces. The platforms on the PL-6K series are suspended by taut aircraft-quality cables that run through massive, oversized sheaves, reducing friction and extending the life of your cables for years at a time with minimal maintenance. Each platform features a dedicated cable rig that raises and lowers its proprietary deck independently of the others. What is the Range of Temperature in which the PL-6K Series can be Operated? The parking lift can be safely operated in the temperature range of 40°F (5°C) to 120°F (50°C). Can I Leave My Vehicle(s) Parked on Top for Months at a Time? Hypothetically, you can leave your top-parked vehicle indefinitely. The lock system ensures that the lift platform is always at a resting position when the locks are engaged. If there’s a vehicle you don’t use as often—like your “weekend ride”—feel free to keep it on one of the top platforms of the parking lift for as long as you like! How Does the Parking Lift Ensure the Rising Platform Stays Level? A perfectly stable rise is essential to your safety. To achieve this purpose, a single hydraulic cylinder is dedicated to each lift deck. A selector switch lets operators choose which platform they are controlling, one at a time. Once activated, the hydraulic cylinder will pull evenly on both sides of the cable. The benefit of dedicating a single cylinder per platform is that we don’t need to use a fluid equalizer to keep fluid pressure even between active cylinders. This reduces costs significantly and eliminates extra parts that require maintenance over time. When used and maintained properly, the rise and descent of these car lifts should be level on both sides.